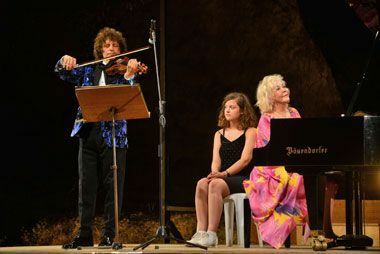 In Turkey’s Gumusluk, Turkish State pianist and UNICEF Goodwill Ambassador Gulsin Onay and the Russian-born American violin virtuoso Alexander Markov officially opened the 15th International Gumusluk Classical Music Festival with an unforgettable concert. Kindly supported by the Mugla Metropolitan Municipality, Bodrum Municipality and organized by the Bodrum Classical Music Association; this year’s festival put together a very special 15th-year program for the classical music enthusiasts. Gulsin Onay and Alexander Markov's duo performed some of the most beautiful works selected from Beethoven, Saygun, Paganini, Chopin, Liszt, and Brahms in the magical settings of the Ancient Stone Quarry. World-renowned Alexander Markov is the gold medallist of the Paganini International Violin Competition. He has performed with most celebrated orchestras internationally including; BBC Philharmonic, Orchestre de Paris, the Montreal Symphony and Budapest Festival Orchestra. Gulsin Onay with a career spanned 80 countries across the globe and countless awards have given concerts in the major musical centers of the world such as Amsterdam's Concertgebouw, the Berlin Philharmonic Hall, the Vienna Konzerthaus, London's Queen Elizabeth Hall. Also considered as the greatest Rachmaninoff interpreter, Gulsin Onay teamed up with Markov- also considered as the most magnificent and harmonious violinists of the world - for the Gumusluk’s festival. They captivated their fans with a magical evening full of classical music. The concert started with Ludwig Van Beethoven's "Violin Sonata no.5, Op.24 “Spring ". The titles of the five chapters were I Allegro, II Adagio molto espressivo, III Scherzo: Allegro molto and IV Rondo Allegro ma non troppo. Afterward, the duo performed Ahmed Adnan Saygun’s - one of the most important composers of Turkish history - "Suite, Op.33 (1956)": I Prelude and II Horon. Followed by a Nicolai Paganini’s capriccio; "Excerpts from Caprices, Op.1". On the second part of the concert, duo performed “Nocturne Op.9, no.2” from Frederic Chopin, “Grande Marche du Sultan Abdul Medjid-Khan” from Franz Liszt and closed the evening with I Allegro, II Adagio, III Un poco presto e con sentimento and IV Presto agitato from Johannes Brahms Violin Sonata no.3, Op.108. The 15th International Gumusluk Classical Music Festival will continue with a concert from French-Cypriot pianist and composer Cyprien Katsaris on the 12th of August. Festival will end on the 4th of September. The festival programme and the ticket information can be found for all concerts and events at www.gumuslukfestival.org.